A Northwestern fencer prepares for a bout. The Wildcats are sending 12 fencers to NCAA Regionals this weekend. 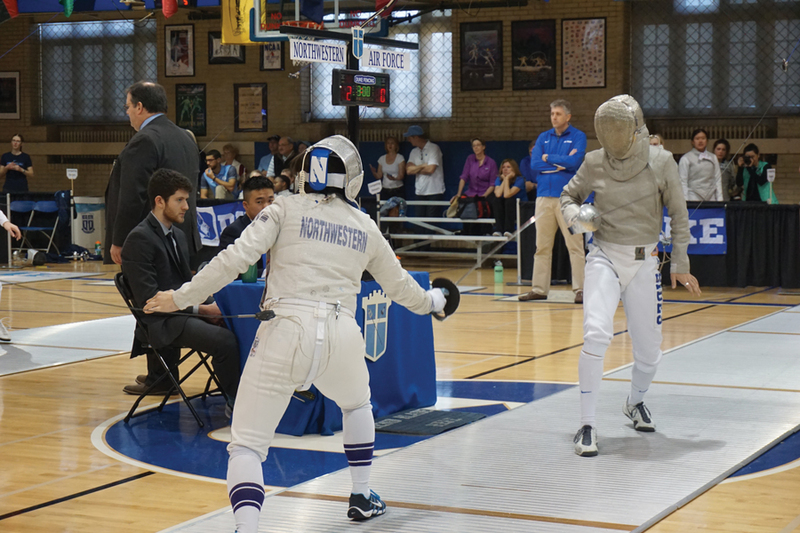 With the team-centric part of the season over, Northwestern is now focused on getting as many fencers as possible to NCAA Championships in State College, Pennsylvania, in two weeks. Standing in the Wildcats’ way is this weekend’s NCAA Midwest Regionals in Cleveland, Ohio. The three best teams at the regionals are No. 1 Notre Dame, No. 4 Ohio State and No. 9 NU. In addition to those powerhouses, Cleveland State, Detroit-Mercy, Lawrence and Wayne State are also sending fencers to the event. At last year’s regionals, all but one medal spot went to a fencer from the top three. The Cats are sending 12 competitors to regionals this year. Competing in the epee event are sophomore Pauline Hamilton, senior Katie Van Riper and freshmen Marta Amador Molina and Anya Harkness. In the foil event, junior Yvonne Chart, sophomore Amy Jia and freshmen Sarah Filby and Justine Banbury will be fencing. Freshman Alexis Browne, junior Maddy Curzon, sophomore Abby Tartell and senior Emine Yücel are fencing in the sabre event. The freshmen lead the team with five rookies competing in Cleveland. Coach Zach Moss said the group as a whole has adjusted to college fencing well and their results this season showed. Five fencers have experience from last year’s Midwest Regional in Detroit: Chart, Curzon, Hamilton, Van Riper and Yücel. Of the returnees from last year’s regionals, Hamilton was the highest finisher, tying for third place. The sophomore is also the only NU fencer on the roster who has competed at NCAA Championships. All the fencers competing this weekend have winning percentages of .600 or better. Van Riper leads the group with 51 wins overall, while Filby has the highest winning percentage at .771. Unlike other individual tournaments the Cats have fenced at this season, there will be no direct elimination round. With only a round robin tournament, the winner will be the fencer with the most wins, and the tiebreaker will be the difference between touchés won and touchés lost. Curzon said this tournament is “one of the more nerve-wracking” of the season because of this different individual format. Selection for the NCAA Championships is a complicated process. For the Midwest Regional, Moss said there are four spots available for sabre fencers, five for epee fencers and six for foil fencers. However, it is not only regional results that account for making it to NCAAs; regular season results also factor into consideration. After those spots are filled, there is a possibility for fencers to make NCAAs via an at-large bid. In considering at-large bids, only regular season results are looked at. While qualifying for NCAA Championships is no easy achievement, Moss said he wants to see the Cats be competitive in every bout and fight with the other top competitors in the regional.